Der Luftkülers (DLK) proudly present Düb Splash. Come hang out with fellow Volkswagen enthusiasts and show off your Düb. "Der Luftkülers (DLK) and DFW Bug Jam proudly present Düb Splash 2019. Come hang out with fellow Volkswagen enthusiasts and show off your Düb Sunday April 28th 2019. Top 25 awards for both Air-Cooled and Water-Cooled VW’s with the BEST trophies in Texas. 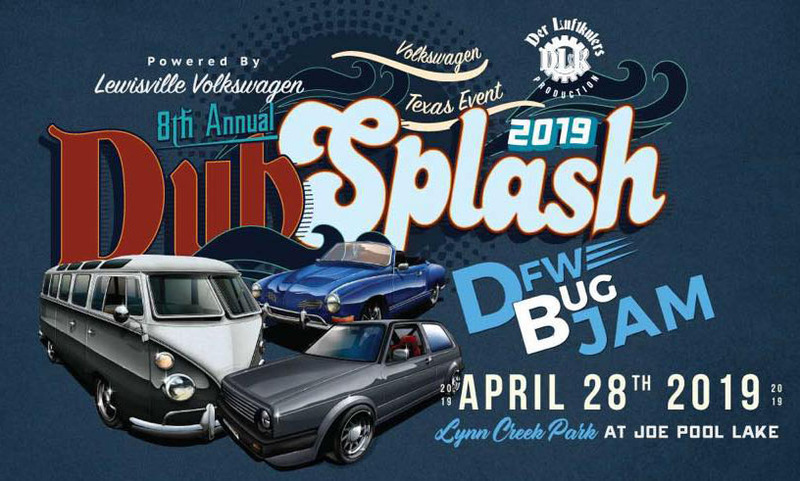 Düb Splash 2019 is being held at Lynn Creek Park at Joe Pool Lake. A lakeside venue is the perfect place for the biggest VW Show in TEXAS!! Come enjoy your favorite cars, best friends, swimming in the lake, a live DJ, and a live band. Düb Splash is sure to provide entertainment for the entire family!!"